These are different words for the same set of techniques. Stucco is the Italian word which was learned by gentlemen on the Grand Tour, who invited Italian or Swiss plasterers back to England to decorate the ceilings, overmantels and other grand spaces of their country houses with freehand modelling in lime plasterwork to impress. Artistic local English plasterers were quick to pick up on this fashion and there are many more modest houses which have been decorated in the same way. In England this is called Pargeting. Some pargeters were more skilled than others. 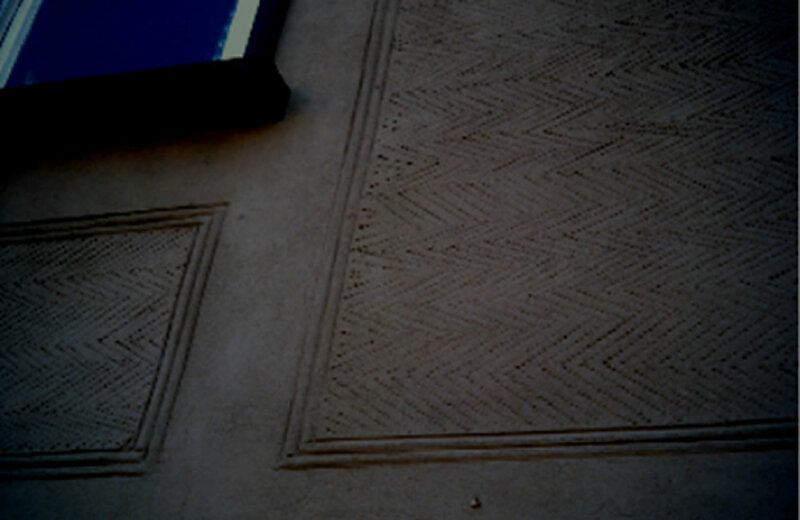 Quite frequently seen are simple combed and stamped patterns on the outside of buildings which catch the light and add texture to the wall surface. Much more skilled were the plasterers who created this ceiling in the Tudor House in Yarmouth for a local merchant. 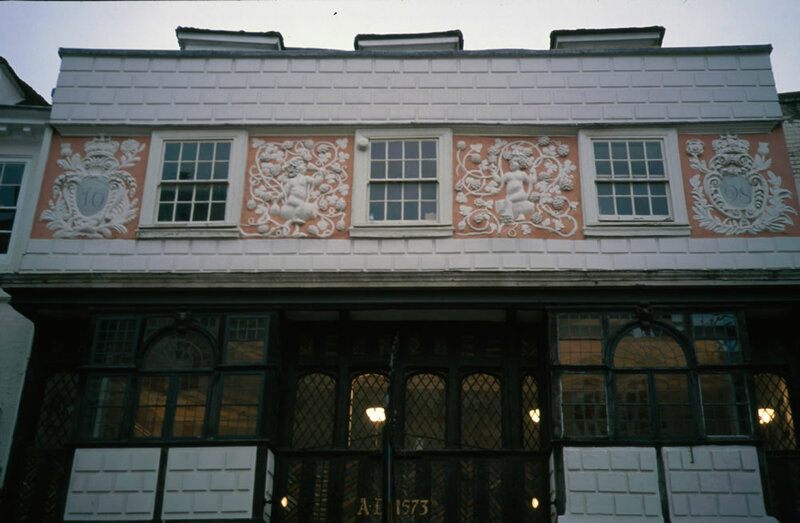 Over the years there have been several skilled plastering companies who included such highly ornamental work in their repertoire. It is not easy to get a good balance of texture and shapes. It has to be meaningful to look at from far away while also having enough detail to be interesting close to so a skilled freehand pargeter has always been well respected in the trade. There has never been a training school for pargeters in this country so the best pargeters of the past must have learned the skills of lime plastering in a normal apprenticeship. Probably with a top plastering firm and then they must also have practiced alone and taught themselves the artistic skills needed to plaster creatively. 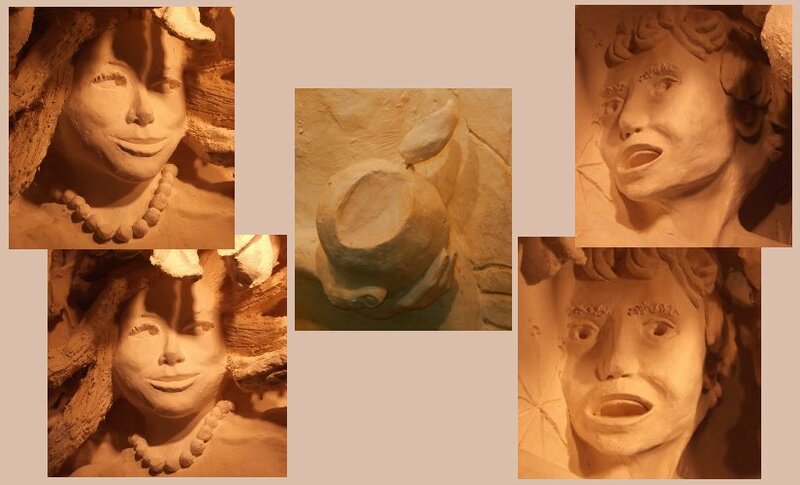 My pargeting is modelled with a beautifully malleable plaster made of lime putty, chalk and synthetic hair. It is somewhat like clay to use, so as well as being ideal for combed or stamped pargets, it can be modelled into sensuous shapes in low relief up to 30mm deep. If stainless steel supports are put into position then the plaster can be built up onto and around them. There is then no limit to the depth of the parget. Recently I have enjoyed experimenting with modelling in very high relief so the parget is effectively freestanding. The Adam and Eve parget was my first large scale work. 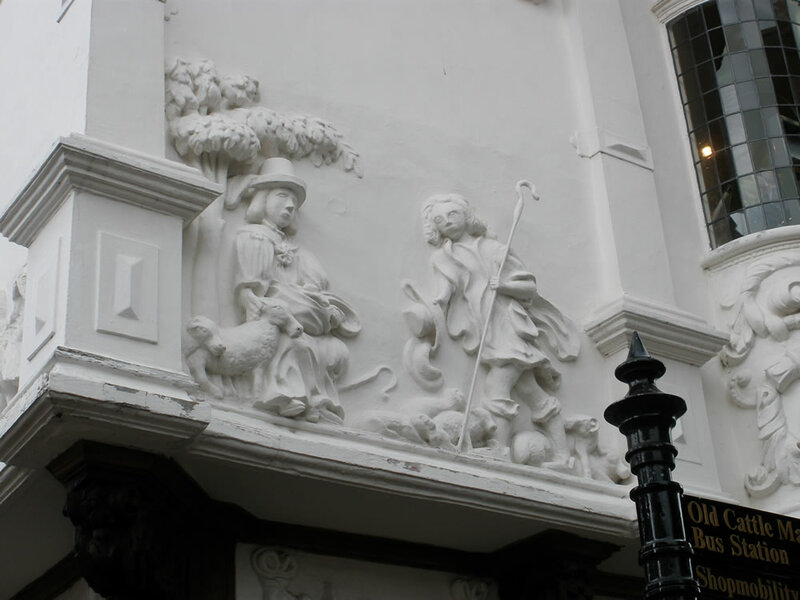 High relief pargeting was not uncommon in the past – think of little fat putti in Italian churches – but I do not think anyone else is doing it in England at the moment. Coloured pigment can be added to the mix for indoor work, and limewash (traditional paint) is the best finish for outdoor work. Traditionally, earth pigments in red, yellow, brown, black colours would have been used but most acrylic paints work just as well, giving a wider range of colour options. In England, outdoor work is preferably done between May and September so the plaster sets well before the first frost. Outside those months physical protection and perhaps heating will be needed to help the plaster set. Pargeting, the decorative plaster finish for the outside of houses is familiar to anyone who knows East Anglia well. Highly ornamental and well recorded pargets like that on the Ancient House in Clare are regularly photographed, but simpler pargeting is often overlooked although it is to be found in every Suffolk village. This is a more recent parget in a similar style and you can see that instead of the earlier three dimensional effect there is a simple flat surface with a random pattern marked into it. After the 1939-45 war, a generation of young men had missed out on apprenticeship training, but there was an urgent need for new and refurbished houses, so instead of traditional lime plaster, the outside of houses was plastered with cement render. This was good in one way because cement sets more quickly than lime. So the plasterer did not need to tend the wall for so long and could move briskly on to the next job. However it did mean that a generation of plasterers grew up who knew nothing about the sensuous modelling which is possible when lime plaster is used. If a home owner in 1970 wanted their house rendered with pargeted panels then their plasterer would as a matter of course render it in sand cement render. Unfortunately, sand cement render cannot be modelled in the three dimensional way that a good old traditional well haired lime plaster can be modelled. So all the plasterer could do was to make indents into the flat surface. 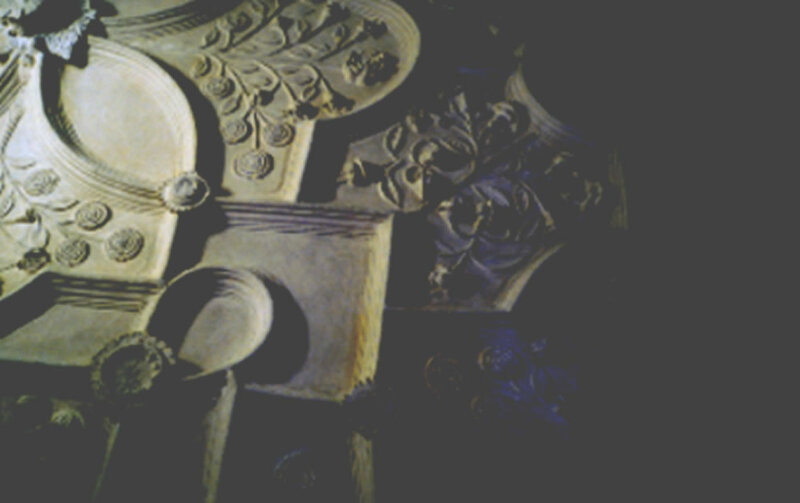 Unfortunately many people do not recognise old parget and ornamental plasterwork for the valuable antique that it is. 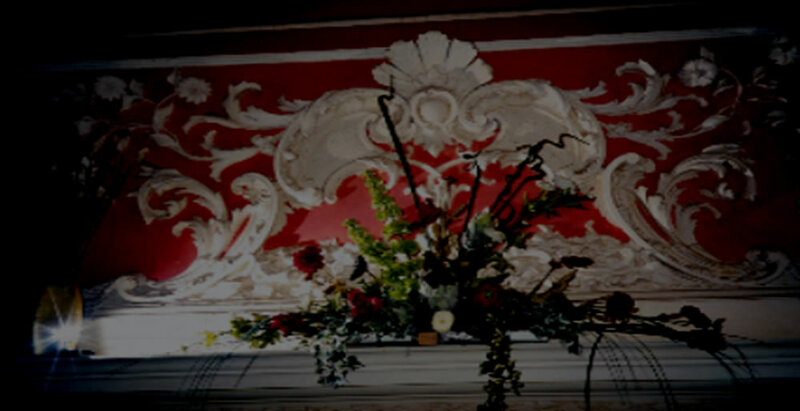 A four hundred and fifty year old table is revered, restored and polished, but four hundred and fifty year old tatty ornamental plaster is consigned to a skip without a second thought, not only by the house owner but more worryingly by the professional plasterers, builders, architects and surveyors that the owner has employed. This is partly because we live in a world where 'classical' is considered to be the best sort of old plaster. By classical I mean those Jane Austin style Georgian houses with symmetrical sash windows and where the plaster walls are perfectly flat and vertical. What we have to remember is that old parget dates back to a time well before the genteel. When people did not care if their walls were flat or their decorative plaster was perfect and a striking general effect was all that mattered. The walls of this farm house are nothing like flat. The house is built of massive oak timbers, which have laths nailed to them and plaster has been put on top of the laths following the undulations of the old timber frame. The building is full of character and life. Undulating walls are a feature which should be appreciated, not thrown away and replaced by an perfectly flat, but boring and inappropriate modern wall. I am based near St Neots, Cambridgeshire but I am happy to work anywhere if the work is interesting.